SALE! Save 25% on select cupcake liners and beach themed items! That’s right folks! IT’S CUPCAKE MANIA! Take 25% off several of our fabulous cupcake liners and colorful beach themed products during our WEEKLY SPECIAL SALE – NOW through July 4th. Discount applied at checkout. Baking cupcakes for a crowd this weekend? Don’t fret! We’ve reduced our 2-day shipping to ONLY $10 bucks! Just place your order by 2:00 pm MST and select “2-day shipping” at checkout to receive your order this coming Friday. Unfortunately Saturday delivery is not available. Summer has finally arrived and we can’t think of a better reason to celebrate! 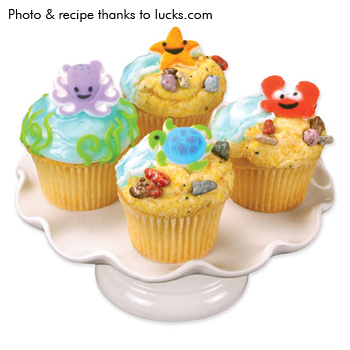 Try these fun “beach” inspired cupcakes complete with a “sandy” beach and blue ocean waves. The folks at Lucks Decorating designed these adorable cupcakes and you can learn how to create them at home by clicking HERE. View our fun collection of summer and beach inspired items HERE. I especially love the sea buddies decorations – their little expressions are sure to make you smile! This entry was posted in Announcements, Cupcake Recipes & Ideas, Summer Fun Baking and tagged beach, crab, Cupcake Recipes & Ideas, decoration, fancy flours, fancyflours, ocean, octopus, pebbles, sale, sand, sea, starfish, summer, turtle by Fancy Flours. Bookmark the permalink. Wow these are too cute! Today is my granddaughter’s 1st birthday. I decided to try my hand at making cutout sugar cookies with flooded icing and decorations. I used your sugar cookie reciepe, and it is the easiest dough I have ever worked with. There is virtually no waste because you can reuse all of the dough since you don’t need any flour for rolling out. And, probably one of the best things is there is only minimal clean up because you roll the dough between parchment paper. Thanks for sharing this reciepe with us. I look forward to continue honing my skills with icing. I do have one question, I tried royal icing and color flood icing but both came out dull, what can I do to get that shiny finish, like the ones you get from the cookie design stores?